Higher thermostability, processivity, and fidelity than retroviral reverse transcriptases, allowing full-length, end-to-end cDNA synthesis from highly structured or heavily modified RNAs (e.g., tRNAs), and RNAs containing GC-rich repeat expansions. 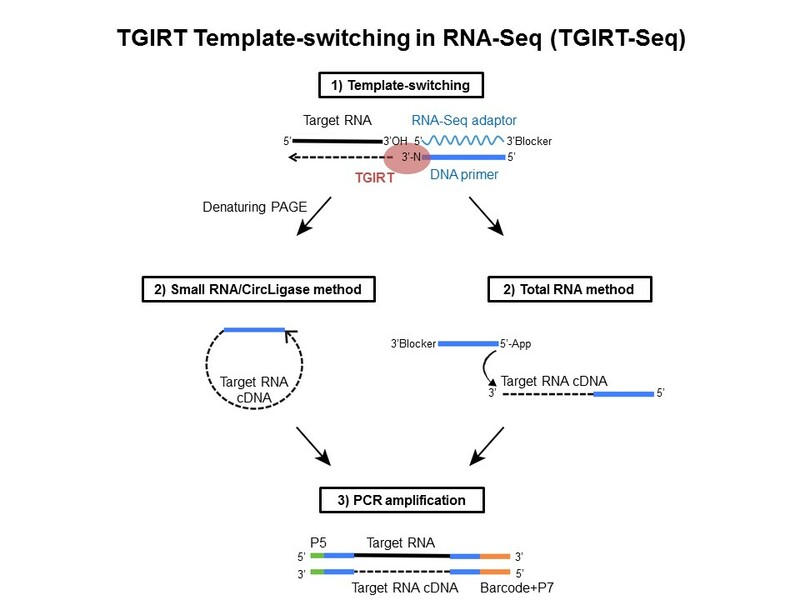 Novel end-to-end template-switching activity that enables attachment of RNA-seq or PCR adapters during reverse transcription and eliminates the need for a separate RNA 3'-adapter ligation step.1 This template-switching activity greatly facilitates strand-specific RNA-seq library construction with less bias than procedures employing random hexamer primer or using RNA ligase for adapter ligation. TGIRT®-seq of ribodepleted, fragmented Universal Human Reference RNA samples recapitulates the relative abundance of human transcripts and spike-ins comparably to non-strand-specific TruSeq v2 and better than strand-specific Tru-Seq v3. TGIRT®-seq is significantly more strand-specific than TruSeq v3 and eliminates sampling biases from random hexamer priming that are inherent to TruSeq. TGIRT®-seq shows more uniform 5' to 3' gene coverage and identifies more splice junctions than TruSeq. TGIRT®-seq enables simultaneous profiling of mRNAs and lncRNAs in the same RNA-seq as structured small ncRNAs, including tRNAs, which are essentially absent from TruSeq datasets. Fast processing time (<5 h for RNA-seq library construction through the PCR step); requires small amounts of RNA (low ng range); comprehensive transcript profiles including mRNAs and lncRNAs together with small ncRNAs, including full-length reads of tRNAs, pre-miRNAs, and other structured small ncRNAs; less bias and greater strand specificity than conventional methods. Fast processing time (< 5 h for RNA-seq library construction through the PCR step); requires small amounts of RNA (low ng range); does not require RNA ligase, is less biased and more efficient by having fewer steps in the procedure. Enables construction of RNA-seq libraries of polyadenylated RNAs using an anchored oligo(dT) primer with more uniform 5' to 3' coverage than retroviral RTs without a ribodepletion step. 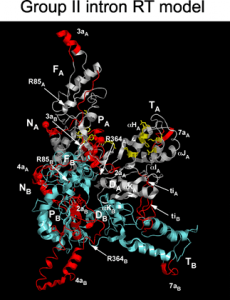 Enables RNA-structure mapping via capillary electrophoresis-based methods like SHAPE or DMS structure mapping with significantly longer read lengths and fewer premature stops than for retroviral RTs. Enables analysis of RNA templates containing GC-rich repeat expansions. Enables synthesis of full-length, end-to-end cDNAs from tRNAs and other small structured/modified ncRNAs, which are refractory to retroviral RTs. Captures precise DNA ends with a simpler workflow by initiating DNA synthesis directly at the 3′ end of a DNA strand while simultaneously attaching a DNA-seq adapter without end repair, tailing, or ligation. Enables analysis of nucleosome positioning, transcription factor-binding sites, DNA methylation sites, and tissues-of-origin.